She wanted to dress up and perform tricks to make people laugh, but that all stopped when she was in primary school. Her classmates made fun of her and she was bullied. "People at school told me to cop on," she said. "They made me feel like it was stupid so I let go of it for a while." "I was really shy and I didn't have any friends. I spent lunchtime standing against the wall just watching everyone else play and have fun." The summer before she started secondary school, Jess began learning to perform magic tricks. She used them as a tool to approach people and start a conversation. "The magic became a way for me to go up to people. I would show them a trick and then they would talk to me." "I had really bad anxiety issues and I just couldn't deal with it. I was scared all the time and I would pretend to be sick so I didn't have to go to school. "I didn't want the teacher to talk to me or make me talk in front of the class. I avoided eye contact with everyone and just kept my head down." Jess had started receiving counselling for the problem but didn't want to stay at school. She left before the start of her final year. "My parents didn't want me to leave but they could see I wasn't happy so they agreed to let me. "I was so relieved. I know school is important but no-one who is hiring a magician or a clown is looking for qualifications. They just want to see what you can do." "At the start, I just winged it but then I started going to circus school in Derry. It just clicked straight away and I loved it." "There isn't a scene here. I know a couple of magicians and clowns but there isn't very much work going for us. "I'm really going for it now. I want to move to America and do this professionally." 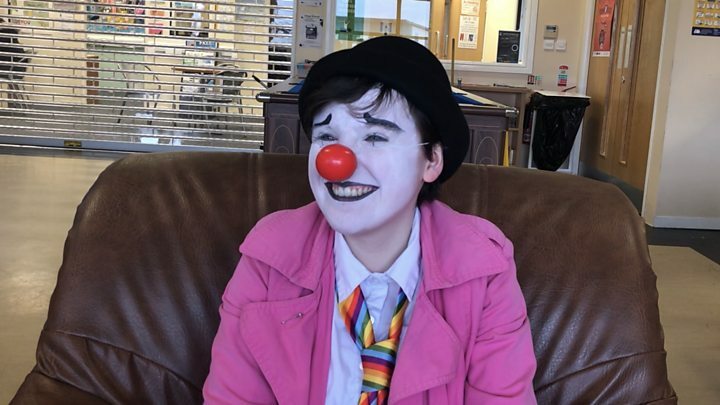 "I chose the name Kazoo the Clown because kazoos are annoying and no-one likes them." "Every time I do a party, I try to find the shy kid to get them up for a trick. "Sometimes they don't want to stand up so I pass the wand down to them so they can be a part of it. "They remind me of what I used to be like. I tell their parents to take them to circus school." "I'm much more confident now. I can perform on stage in front of an audience. It's changed who I am now."